There’s no denying that the Danes love their meat. Participating in just a single Christmas or Easter party should reveal that much. Morten Valentin Holm, however, might just be taking the love affair to another stratosphere. 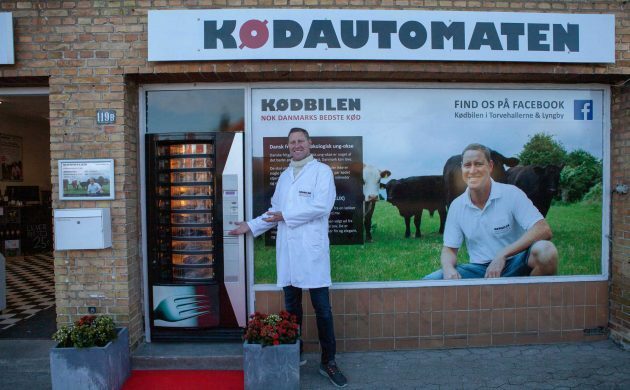 Holm, who runs the popular Kødbilen.dk concept – involving the delivery of meat to customers from a van – has revealed he intends to open Denmark’s first meat dispenser machine: ‘Kødautomaten’. The first dispenser will be open and stocked with organic meat on November 4 in Lyngby, and Holm has set an ambitious target to open an additional 50-100 across the nation over the next year or so. “Meat dispensers are a big success elsewhere in the world. In Germany, there are hundreds of them, and in the US the ambition is for the dispensers to be as common as cash machines. And now the time is ripe to try the idea here in Denmark,” said Holm. The 24/7 dispenser will serve consumers vacuum-packed meat of the highest calibre (according to Holm), offering a broad assortment of meats including entrecotes, minced beef, lamb sausages, rump steak and bacon (naturally). The dispenser will contain ten so-called ‘carousels’ that can be divided up into 36 units, so a full machine will offer upwards of 400 kilos of meat. For payment, Dankort, international credit cards and mobile payment can be used. One of the precautionary measures of the concept includes the machine automatically shutting down should temperatures inside reach above 5 degrees. The machine also has a built-in date control system to prevent any sale of meat that has surpassed its sell-by date.